After returning to work in the second week of January I took private leave from 18th January to 5 February to travel to French Polynesia to join NZ scientist James Russell of Berkeley University as a volunteer to assist him in a conservation project on Tetiaroa atoll. Dr Russell achieved international recognition for an article published in the international scientific journal Nature, which described his ground-breaking experimental work with rats on the Noises islands in the Hauraki Gulf. Making up the three person team senior field technician Sandra Anderson of Auckland University. Tetiaroa which is picture postcard beautiful is situated some 50km north of Tahiti and covers 3366ha of coral reef, lagoon and 12 islands or motu. It is probably most famous because it was owned by movie star Marlon Brando and still owned by the Brando estate. Tetiaroa is very important for breeding tropical seabirds like the brown noddy, red-footed booby, brown booby, white terns, crested terns and great and lesser frigate birds, and historically the island has also been important as a breeding site for several species of turtles. However most if the islands have been infested likely for hundreds of years by Pacific rat or Kiore (‘iore’ in Tahitian), and since the 1970s many of the islands have also been over-invaded by the more destructive ship rat. We arrived on Tetiaroa on Tuesday 19th (NZ) and were based on the ‘main’ island of Onetahi where a hotel chain is constructing an airstrip prior to building a luxury resort. Our accommodation was a modified shipping container in the construction camp. Our focus was on the neighbouring island of Honuea (which is a Tahitian name for the green turtle) which was over-run with ship rats and kiore. We kayaked across to Honuea every day. A 50m x 50m grid of both snap traps and live traps across the island was laboriously set up using GPS and we then set to work removing rats one by one from Honuea. The island was covered in a typical atoll vegetation dominated by Pandanus (rather like a cabbage tree on steroids with spiky leaves) and other leg scratching vegetation like Mikimiki (Mingimingi). Finding ones way to the stations through the often dense undergrowth was often difficult, especially in the high temperatures. The further one moved from the beach and the sea breeze the more overpowering the heat became. Eventually the number of rats caught every day from the 117 traps fell to around half a dozen. At that stage James decided to set out Pestoff bait to finish the job. This was placed every 25 metres, at the former trap stations the bait was pinned to the ground to enable monitoring. This we did all together one memorable afternoon as we marched back and forward across the island through the undergrowth, trying to keep our 25 metre distance, through compass and GPS and though periodic waving and ‘hallooing’ where possible. Though island was infested with rats – unlike in New Zealand they by no means completely dominated the environment. For the rats have to compete with a whole range of crabs – from small hermit crabs ranging to giant coconut crabs which are formidable things bigger than a football. We completed our task just as darkness fell. We had to work through the heat of the day to ensure crabs did not reach the bait before the rats. The next day we went back to monitor the bait take and noted satisfactory rat nibbling. The day after that the hurricane Tropical Cyclone Oli struck. Wind lashed the island and we watched with interest as the giant swells started to flow right over the barrier reef. By midday interest was replaced with growing unease as the sea started to rise higher and higher – and by mid afternoon waves ran right up the beach and started to send water washing around the foundations of our container. At 3pm there was a crisis meeting of all 18 people mainly Tahitian construction workers on Tetiaroa. It was decided at 6pm or before we would all head for a shipping container located by the airstrip on a small hill in the centre of island – bringing bottle water & bare essentials to weather the storm. That changed an hour later when French authorities in Tahiti decided to evacuate everyone off the island. By then sea was coming across the airstrip At 5.30 a large French airforce Super Puma helicopter arrived and all 18 of us dashed for it. Unfortunately we weren’t allowed to bring baggage. But fortunately we had left our travelling clothes in a Pension in Papeete and so after wandering around Papeete in the same clothes for days just before we were scheduled to leave we showered and changed into our smart travelling clothes and headed for the airport. Dr Russell is confident we have been successful and Honuea is rat-free but just to make sure he is returning in March. 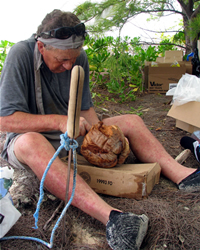 His work on Tetiaroa will be ongoing. This entry was posted in Uncategorized and tagged conservation, Tahiti. Bookmark the permalink.